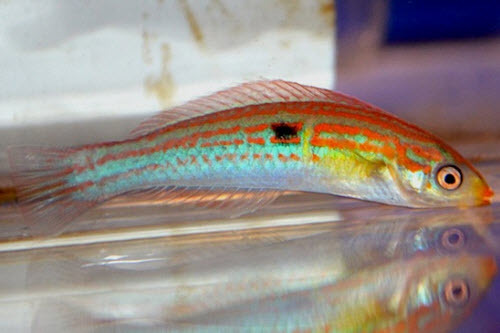 The Minute wrasse is a small colorful wrasse that can reach 2.5 inches / 6 cm in length. 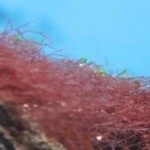 It is the only species in its genus and its small size makes it a perfect fit for small marine aquariums and marine aquarium with sensitive invertebrates in them. 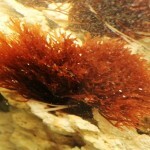 The species is reef safe but can eat small invertebrates. It should not be kept with larger fish. The Minute wrasse is a schooling species and should as such never be kept alone. 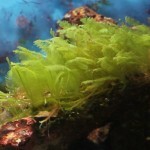 It originates from the south and central parts of the red sea. 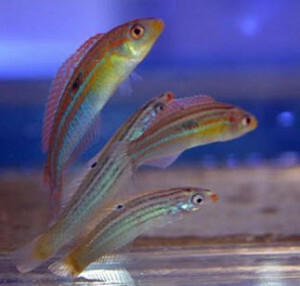 The minute wrasse that is now available at ACI Aquaculture is very rare in the aquarium trade and this might be the first time it has been imported to the USA. 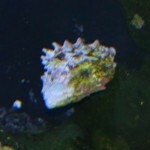 This is a shame since it is a stunning little gem that would make a wonderful addition to our aquariums. 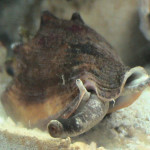 The species is according to my own observations plentiful in the wild in the red sea and the population should support a more widespread harvesting for the aquarium trade if it were to become a more popular species. In the red sea it lives in shallow waters, usually less than 36 ft / 12 meters deep. 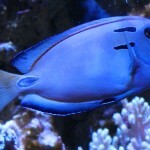 They are usually found in large groups at reef slopes. They are prominently found on the outher reef slopes but can from my observations be found anywhere on the reef where there is a drop of point. 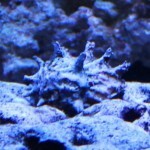 They are usually especially plentiful near caves at the outer reef slopes. This species is as earlier mention best kept in groups but due to the limited numbers that have been collected and brought to the USA at this time it will be virtually impossible and cost prohibitive to to get a whole group. We would despite this like to recommend that anyone who is interested in this fish get at least 2 or 3. You will enjoy them a lot more and it also raises the possibility of breeding this species. 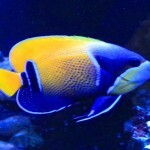 Captive breeding on this species is highly desirable since it could make an excellent addition to our hobby. Tap Water or RO Water, What’s the Big Deal ??? 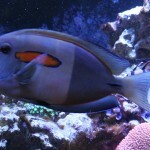 Experinced Freshwater aquarist that has kept aquariums for more than 25 years and is allthough having kept occasional saltwater tanks for roughly the same amount of time only now switching primary focus towards saltwater. WilliamExperinced Freshwater aquarist that has kept aquariums for more than 25 years and is allthough having kept occasional saltwater tanks for roughly the same amount of time only now switching primary focus towards saltwater.